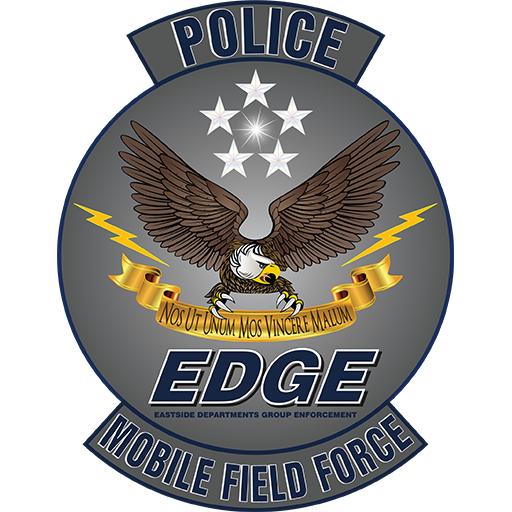 The EDGE Mobile Field Force (MFF) Team was authorized to organize in October, 2015. Through this authorization, the team was created and became available for deployment on July 14, 2016. The Mobile Field Force is designed to provide rapid, organized and disciplined response to civil disorder, crowd control or other situations. Mobile Field Forces are formally structured teams based on a platoon of law enforcement officers from multiple agencies with an assigned leader. Tactics used are based on small squad tactics developed by the Office of Domestic Preparedness as well as the more traditional Mobile Field Force and general police patrol tactics. During 2018, the EDGE MFF team maintained a state of readiness and availability for deployment. This was accomplished through regular training sessions as well as on-going outside training for our members. At its inception, the MFF team consisted of 40 members. Due to resignations and retirements, the MFF team ended 2018 with 36 members. In 2018, the MFF team had no deployments to EDGE communities and no mutual aid deployments. There were several occasions that the team prepared for, but there was no deployment necessary. Outside training in the areas appropriate to MFF operations are still not the norm in law enforcement. These training opportunities are not offered as frequently as traditional tactical training opportunities; however, it appears more opportunities will be available in the future. More and more trainers and law enforcement leaders throughout the nation are recognizing the need for organized MFF units. This trend should begin to drive the need for more specialized training opportunities for MFF teams in the future. Despite the current situation, as it relates to specific MFF training opportunities, the EDGE MFF team continues to make every attempt to identify useful outside training opportunities; sending officers when appropriate. In 2019, the MFF team will seek to add 4 additional members to bring the manpower of the team back to the original operating strength of 40 officers. The team will continue with the monthly training schedule, which will include a focus on field force, crowd control and extrication tactics. Trainings will also include firearms drills, officer rescues and first aid. If possible, joint training sessions will be planned with other MFF units in the region and beyond. Members will continue to take advantage of the free training opportunities offered by the CDP in Alabama. In December 2018, Sergeant William Martin of the Shaker Heights Police Department announced his retirement from law enforcement. Sgt. Martin was the driving force behind the creation of the EDGE Mobile Field Force and the team’s commanding officer. Lt. John Camper (SEPD) was named interim commander.